Birgit Nilsson’s complete Decca, Philips and Deutsche Grammophon recordings marking her 100th birthday and produced with the full support of the Birgit Nilsson Foundation. 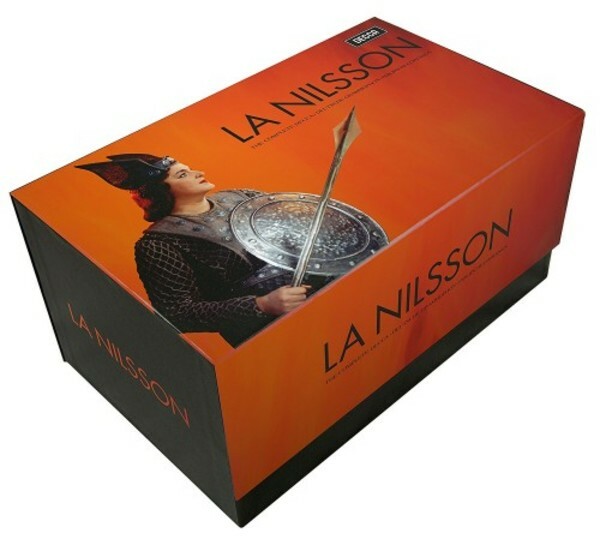 Limited edition 79-CD + 2-DVD covering all the major roles Nilsson performed: 27 full-length operas, including 2 full Wagner ‘Ring’ cycles (Solti & Böhm), 2 complete Tristans (Solti & Böhm), 2 Turandots (Molinari-Pradelli & Leinsdorf) and 2 Don Giovannis (Leinsdorf & Böhm). DVDs of the MET production of Elektra, and the Golden Ring documentary of the making of the Solti Ring.